It’s that time of year again; when we gather together to celebrate the national holiday that is the Big Game. Whether you’re hanging out at home with friends or making the trip to Arizona this year, it is sure to be a day full of fun, food and loud noises (not to mention the best commercials of the year). A long-standing tradition of the Big Game is predicting its outcome. Here at Point To Point, we thought it would be fun to make a prediction of our own. As a B2B digital marketing agency, we do a lot of work with building products and marketing to architects, so we decided to look at the relationship between Big Game outcomes and annual housing starts to see if it could predict housing sector activity for 2015. We gathered a bunch of data on housing starts by region from the year of the first Big Game to present and used it to see if housing starts in one region of the US were more affected by a Big Game win than others. To do this, we went through our list of winners from 1967 to 2014, categorizing them by region based on the map from our housing data, which divides the United States into four regions, the Midwest, the South, the West and the Northeast. Next, we calculated the total number of housing starts in each year the Big Game occurred. For example, in 1967, the Packers won the Big Game. The Packers are located in Wisconsin, which would fall into the Midwest region of the United States. In 1967 there were approximately 309,800 housing starts in the Midwest. We completed the exercise for all 48 games, totaled up the housing starts for all winning teams in each region and took an aggregate using the total number of games won by teams in each region. 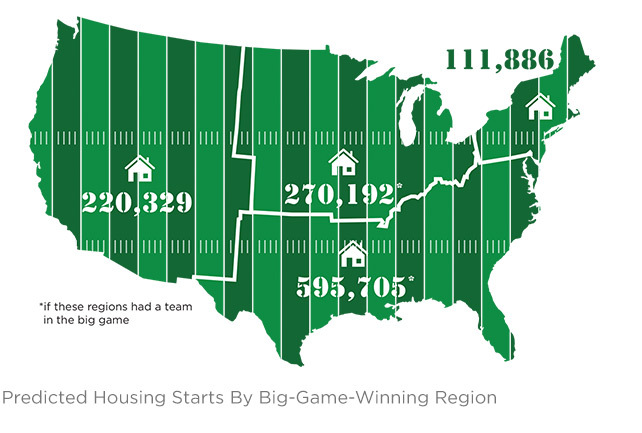 For example, the Northeast had a total of 1,838,400 housing starts when a team from that region won the Big Game. In the history of the Big Game, a Northeastern team has won 13 times, so we divided the total number of housing starts by 13 to get an average number of housing starts per game won. Here’s where it gets fun (if you like numbers). To come up with any kind of fair prediction, we needed a way to equalize the regions, since region sizes and populations vary so widely. We decided to use population density. After tallying up the population of each state and determining the total population of each region, we calculated percentages of the total population of the US that each region comprised, so we knew who had an advantage, being bigger or smaller. We factored that into our final calculations, and used the number of Big Game winners per region throughout history to predict the percentage of each region’s population that would build new housing if the winning team was from their region. To do this, we took the total number of housing starts in each region divided by the total regional population. We then converted those values to numerical values, to determine the number of people that would build a new home for each win achieved. With this knowledge, we’re ready to predict how many people will build new homes this year if the Seahawks win, versus if the Pats do. We predict that if Seattle wins the Big Game this year, the West will see about 220,329 people building new homes. And if New England wins, about 111,886 people will build new homes in the Northeast in 2015.